This post will be updated as new information and art become available. Please bookmark and check back often, or follow @AdamLambertHK2 on Twitter for updates. Seeing that the label hasn’t done much to give him the promotion he deserves, Kris Allen fans are taking matter into their own hands. 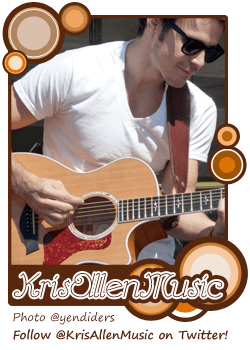 Kris Allen fans are gifting his new single Alright With Me this Friday, November 5, 2010, for a mass sales push. You don’t have to be actually mass gifting to be on this list. Buy a copy for your parents. Your friends. Or even yourself. Imagine each Kris Allen fan buying just 1 copy of AWM off iTunes on Friday. Think of the impact and message it will send to the label (which is totally lacking in the marketing department). Since we have so many gifters already, if you run out of people to gift, you can always purchase duplicates for yourselves, like I did. EVERY PURCHASE COUNTS! Lists updated on Nov 8 2010 with 40 gifters, and @ArtistSupporter alone has gifted 320+! Woot!